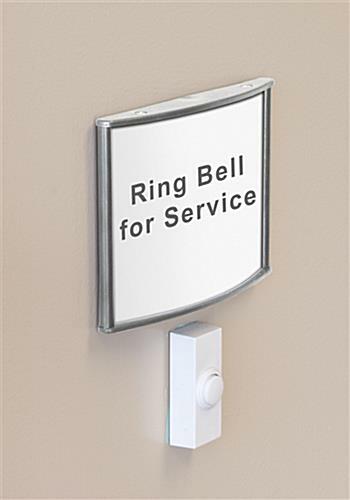 These Office Directory Signs Feature a Silver Finish to Coordinate with Any Indoor Setting. Each Unit Includes Double-Sided Tape for Quick Wall Mounting. Media Size: 4" x 5.5"
2.5" x 8.5" 3" x 4" 3" x 5" 3" x 8" 3" x 11.5" 3" x 15"
Curved silver design for a contemporary look. Double-sided tape included for wall mounting. Includes non-glare lens to protect prints from damage. 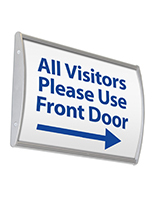 These office directory signs that have a protective lens, such as directional signage, are an inexpensive way to guide visitors or new employees to the right destination. 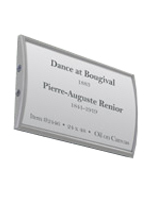 Fabricated from anodized aluminum with plastic end caps, these displays are durable to withstand years of use. 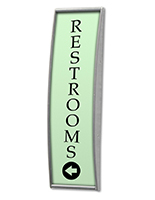 These office directory signs that stick to a wall feature a unique curved design that is sure to draw attention to your displayed advertisements. 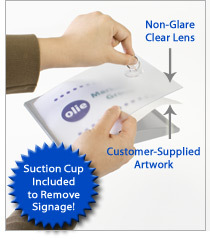 These architectural signage displays are provided with a non-glare lens, to prevent glare from hindering the view of your posters and advertisements. 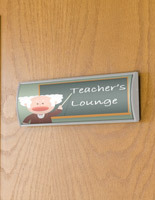 These stylish office directory signs, also called wall frames, permit users to easily change their graphics. Each product comes with a suction cup, enabling users to lift the non-glare lens, and slide new graphics underneath. Though these silver office directory signs do not come with graphics, customers can easily create and print their own using a regular printer. 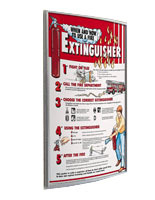 These wayfindings can be easily wall-mounted using the provided double-sided foam tape on the back of the frame. 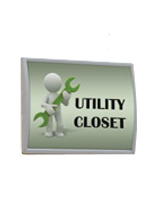 These office directory signs that adhere to a wall can be mounted both vertically or horizontally on most flat surfaces. 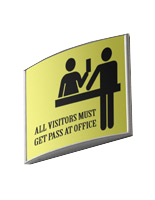 By displaying corporate signage on the wall or door within a lobby, store or business, visitors can easily find their way to a specific room or area. 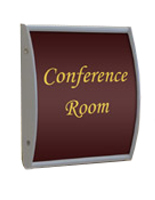 These name plates, office directory signs for businesses are great for use in indoor areas such as lobby reception areas, retail stores, hospitals, museums, art studios and offices. These corporate signage displays are available in many other sizes as well, in addition to the size seen here (see related products to the right). 4.3" x 6.0" x 0.875"